Winter can take a toll on new homes in Portland. The best time to prepare new modern homes for the cold months of December of March is during the fall, while daylight lasts through the late afternoon and early evening. Reverse the ceiling fan’s blade movement. Reverse the direction that the ceiling fan blades move so they turn clockwise. Because warm air rises, the warm air will circulate around a room better when you turn on the ceiling fan. Clean your gutters. Don’t let your gutters turn into roofline planters. Clean out any debris accumulated in your gutters. 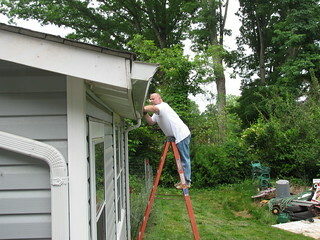 Then use a hose to flush out the gutters and downspouts. If the gutters have a leaf guard system or screen, you still need to flush out the dirt and seeds that made it past the barrier. Test your smoke alarms and carbon monoxide detectors. Make sure there is a smoke alarm on each level of your home and one inside or near every bedroom, high on a wall or on the ceiling. If your home has gas appliances or uses natural gas, place a carbon monoxide detector near each smoke alarm. Replace the window screens with storm windows. Storm windows add an extra layer of protection on windy days. They also add an extra layer of insulation, which may help lower your energy bill. Insulate your pipes. Pipes freeze in old and new modern homes alike. When the water in a pipe freezes it can cause the pipe to burst. Disconnect hoses from outside spigots, drain them and store the hoses for the winter. Turn off the water to your hose bib using the turnoff valve, drain the lines and insulate the spigots with a special Styrofoam cup that you can purchase at a home improvement store. Then insulate the pipes in unheated spaces (e.g., garages, basements or crawlspaces) with pre-molded sleeves made for pipes or heating tape. While catching the football game may sound like more fun than preparing your new home for winter, it’s one of the best ways to protect your investment when a cold snap hits.